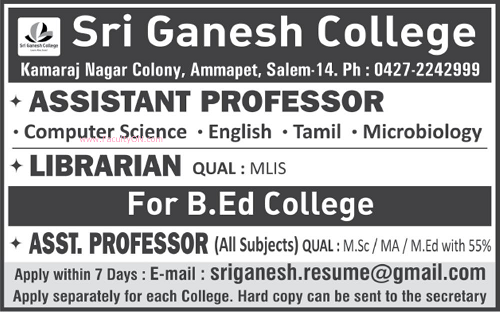 Sri Ganesh College of Arts and Science, Salem has advertised for recruitment of Assistant Professor / Librarian jobs vacancies. Interested and eligible job aspirants are requested to apply within 07 days from 25th November 2018. Check out further more details below. About College : Education is a progressive discovery of our own ignorance. As the chairman of the college, I welcome you all ignited minds to be a part of the SRI GANESH GROUP OF INSTITUTIONS , which has been one of the leading educational institution in Salem . It is known for its conspicuous efforts taken for the betterment of its stakeholders. It has directly or indirectly played a crucial role in carving a new niche for the students belonging to rural and urban areas of Tamilnadu. How to Apply: Interested and eligible candidates are requested to send CV along with all copies of certificates / testimonials and recent PP size photos to the email address or postal address provided here. Apply separately for each college.